Imagine floating over the Willamette Valley’s beautiful wine country in one of the greatest adventures of a lifetime. No two flights are the same, though they are all an experience you will not forget. You can choose to get married in the air (our largest balloon can fit 8-10 guests, plus a pilot) or you can get married on the ground with an inflated balloon (or balloons) as a backdrop! A dawn wedding outdoors in Oregon’s wine country is a delightful way to do something different on your special day. We can help you round out your event with our sparkling brunch after the flight. As an alternative, you are also free to cater your own breakfast. Price per person depends on your choices including number of guests and balloons used. We can fly up to approximately 40 of your guests in our balloons for a 1-hour flight. Please contact us so that we can work with you to create your perfect event. Additionally, we recommend that you read our Blog post which contains some great links to other sites for balloon-related weddings. 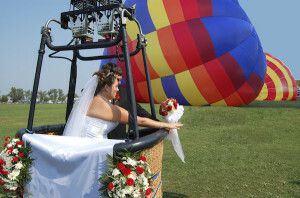 There is no standard “menu” for how you can have one – or several – hot air balloons be a part of your wedding. We would be happy to help you work through options that fit your interests, plans, and budget. Please see this link for more information, including pricing. 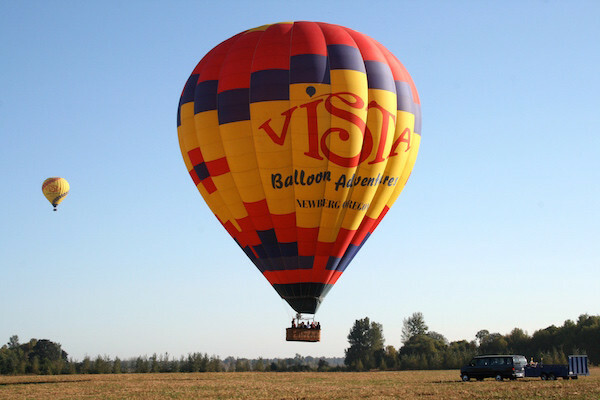 We are the Pacific Northwest’s largest and oldest hot air balloon company, with 25 years of satisfied customers. Unlike other operators, not only will you enjoy a view of the area’s natural sights, but also the beauty of other balloons flying around you. We operate six FAA-certified state-of-the-art aircraft, and our FAA-licensed commercial pilots have thousands of hours of experience. The largest of our balloons can accommodate up to ten people, and we also have a special (smaller) balloon available for those interested in a private flight for two. Upon landing, our ground crew will meet you to pick you up and deflate your balloon. You are very welcome to participate, however, it’s completely fine if you choose to stand by and admire the process. After the balloons are deflated and put away, board our vans for a 15-minute ride back to the launch site where you will be served a sparkling brunch. Plan on approximately 3 hours for the whole experience. Contact us! We typically fly April through October, weather permitting. Your hot air balloon adventure begins just 30 minutes south of Portland in a safe, relaxed, and most importantly fun environment.